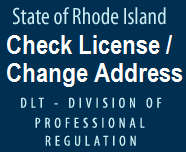 Welcome to DLT's Professional Regulation On-line web site where you can check a trade license or report a change of address. Here you can search for a trade license by trade, license number, name, city/state, or telephone number. The system will display the following information...... and alert you to violations, etc. Here you can search for violations or violations history by license number, name, city/state, company name, or telephone number. Here you can search for your application and test date/time by license type, name, city/state, or telephone number. Here you can search for apprentices, sponsors, and reciprocals by number, name, city/state, trade code, or telephone number. Here you can request a change of address by providing your name, trade, license number as well as your old and new address information.